The Kansas City Chiefs host the Indianapolis Colts in this weekend’s playoff matchup, so Kansas City’s KCTV5 sent a helicopter out to get aerial shots of the city’s football stadium before the game. What the cameras ended up seeing was much better than shots of a 50-year-old stadium could have ever hoped to be. Someone was playing Mario Kart—specifically, Mario Kart 8 Deluxe. I’ve never played Mario Kart on an enormous screen, but I did once play Madden on a giant projection screen. It was amazing. It has to be how God plays video games. But this was not some rogue employee who snuck into the scoreboard operators’ booth and plugged in their Nintendo Switch. 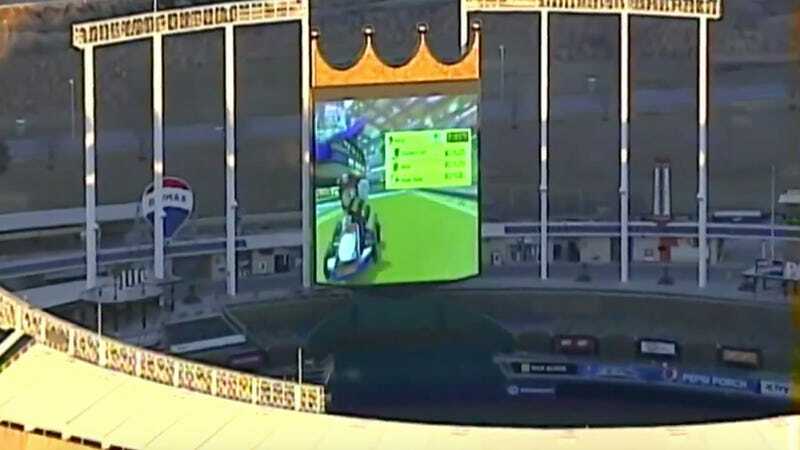 The Royals used the big-screen Mario Kart as part of an internal campaign to get employees to support Royals Charities, the team’s foundation. The staffers were competing in a tournament on the team’s giant video board. Logistically, it was rather simple: The Royals plugged the Switch into the console that runs the video board using a converter; competitors played from the press box. Next season, beat reporters are going to be bugging teams to let them get in on this after games end.